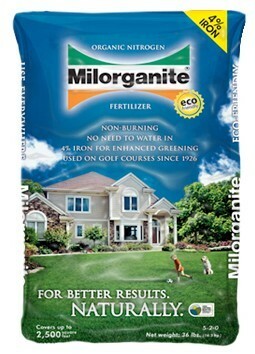 Milorganite Manufactures Organic Nitrogen Fertilizer for Better Lawns and Gardens, Naturally! Gardenality is proud to have Milorganite as a sponsor helping us to leverage technology to enhance gardening experiences around the world. We encourage you to visit their website and to use Milorganite organic nitrogen fertilizers in your lawn, landscape and gardens! Headquartered in Milwaukee, Wisconsin, Milorganite has been a world leader in supplying Organic Nitrogen fertilizers for professional and residential use. While revenue generated through the sale of Milorganite products does not make up for the entire cost to produce and market, our belief in beneficial reuse and recycling makes producing our value added products the clear choice. For over 85 years Milorganite has fertilized golf courses, home lawns and gardens. Milorganite is worry-free because it contains virtually no salts, so it will not burn plants – even in the hottest temperatures and driest conditions. You don’t have to water it in, it will stay in the soil ready to work when moisture comes later. Milorganite’s slow-release formula provides nitrogen and other nutrients over an 8-10 week period for even growth (without excessive grass clippings) and better root development. Because grass is able to use these nutrients over a longer period of time, less fertilizer is wasted by seeping into groundwater or running off into streams. Milorganite contains 85% organic matter, which promotes beneficial microbial activity and improves the soil’s ability to grow and nurture grass and plants. Because it doesn’t leach, it is ideal for sandy soils. Milorganite’s iron is exceptional at delivering a long-lasting green. Unlike iron salts in some synthetic fertilizers, Milorganite’s organically complex iron won’t stain concrete. Milorganite is one of the nation’s oldest recyclers, transforming a byproduct into a highly effective fertilizer. No mined resources are used in its production. A landfill gas project will also significantly reduce Milorganite’s use of natural gas and "green" our production process. Milorganite was recently certified by the USDA as a bio-based product since it is derived from renewable materials. It takes more than nitrogen, phosphorus and potassium to optimize plant vigor. Fortunately, Milorganite contains all 13 essential plant nutrients, including secondary nutrients like calcium and micronutrients like iron and zinc. Safety is our number one concern. Milorganite is more heavily tested and regulated than any other fertilizer and the product consistently complies with all standards for protecting human health and the environment. Research conducted at the University of Georgia suggests that Milorganite is a useful tool in repelling deer from grazing on food plots and ornamental plantings.